The Animals' Christmas Carol was written many hundreds of years ago (late 12th to early 13th century), yet I did not know this particular carol until last year when I heard it on the Cedermont Kids Christmas Carol CD. The song, which portrays the animal's roles in the nativity, was one of Logan's most favorite songs on the CD. "I" said the donkey, shaggy and brown,"I carried His mother uphill and down,I carried her safely to Bethlehem townI" said the donkey, shaggy and brown. "I" said the sheep with curly horn,"I gave Him my wool for a blanket warm,He wore my coat on Christmas morn,I," said the sheep with curly horn.And every beast by some good spell,In the stable dark was glad to tell,Of the gift they gave Emmanuel,The gift they gave Emmanuel." Helen Ward's book, The Animals' Christmas Carol, is based on these same lyrics. She begins with an introduction to the Christmas story and adds in the traditional lyrics as well some exotic animals to the stable. The cows, the camels, and the sheep all star in this beautifully illustrated book, but the peacock, the mongoose, and the humble woodworm also make appearances. It is a warm book that brings the lullaby of stable to your home for Christmas. After reading this book, I tried making an edible nativity for the boys. You will need a piece of bread, pretzel sticks, peanut butter, a graham cracker, a large marshmallow and a small marshmallow. My boys took one look at this concoction and asked for something else for lunch. So we had plain peanut butter and jelly. Later we made this one instead. We used cheerios for the hay, a large marshmallow for the swaddling clothes, and a tiny marshmallow for the baby Jesus head. We found the idea for this fun snack at Hubbardscupboard.org. I have to share this funny tidbit too. I'm not sure if the Bible story last Sunday was Moses or Baby Jesus, but somehow Logan got the two mixed up. Now when we read our Christmas books, he refers to the baby in the story as "Mosey Jesus". Nothing like a Christmas story mash up! Oh, and don't try to argue with a 3 year old who has been to church! This was one of our 12 Days of Christmas books and activities. 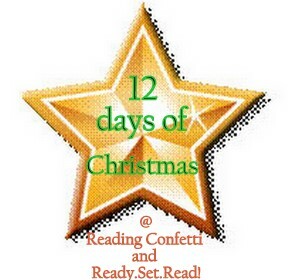 We are collaborating with Reading Confetti to bring you 12 Days of great Christmas books and crafts. Check out my 12 Days of Christmas Pinterest Board for all of the books and crafts. Jackie, great minds think alike!! I'm posting my candy nativity tomorrow! I love yours and it's soooo much healthier than mine. Love the "Mosey Jesus". My 3 year old kept hesitating about eating the candy we made Baby Jesus with but eventually his sweet tooth won out. My son probably would have ate all the stuff on top and left the peanut butter sandwich part. Cute snack. I love your nativity! JDaniel would have loved the marshmallow!